Finally! Almost 5 weeks after moving in, I have working internet access. I know, I know. It’s a totally First World Problem. But, hey, I missed sharing my creations with the world 🙂 But, internet is finally on, and my sewing room furniture is being slowly assembled (come on Philip!) AND remember, the missing silk? It’s turned up!! Big smiles all round. Anyway, I am back with something I sewed up a couple of weeks ago and have been wearing LOTS since I made it. 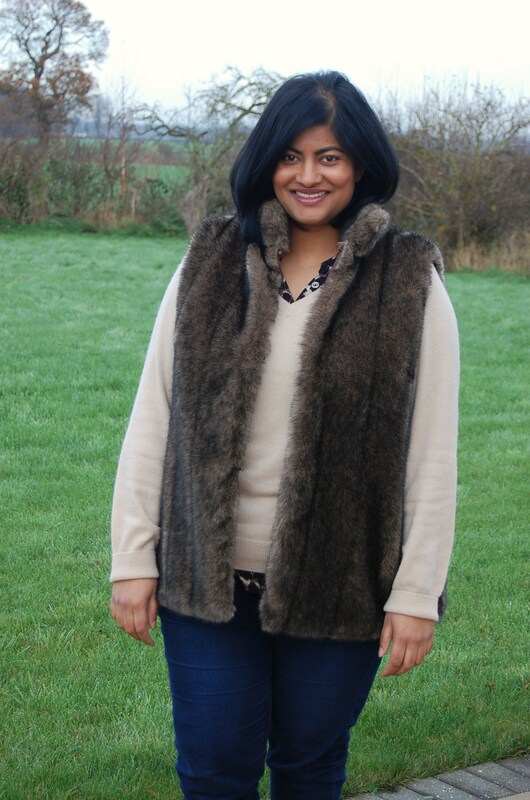 It’s the most snuggliest, cuddliest, warm faux fur gilet. 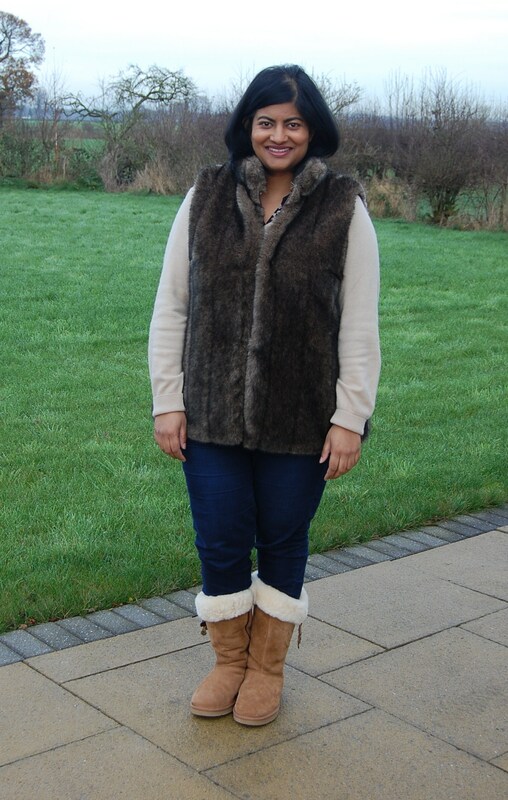 I made this gilet using OOP Vogue 8674, view A, with the collar from view B/C. I chose this pattern because I had it in my stash and I wanted a pattern for a lined vest. I have been looking around for faux fur for a while now. The good stuff is not cheap. So when I came across this gorgeous quality Tyber faux fur, manufactured in Belgium, on my local market stall for a very reasonable price I snapped up 2 metres. (I got 2 metres because I knew DD Kezia would want a gilet too, so expect to see a mini version soon. The 2 metres is enough to sew this gilet for me, a version for Kezia and still enough to do hats or maybe a little capelet etc.). My one regret (not that it’s stopped me wearing the finished garment at all), is that I didn’t go for a more luxurious lining. I used an acetate lining from my stash. This was supposed to be a quick and not too expensive project. I sewed Hemline fur hooks to the inside as closures. Full pattern review below. MISSES’ JACKET AND BELT: Semi-fitted, lined, sleeveless jackets A, B, C in two lengths, have front button closing, darted front and topstitch trim. B, C: stand-up collar and attached, unlined capelet. C: self-fabric belt. A, B, C, D cup sizes. I made a modified version of view A with the collar from view B/C. Probably not, but that is simply because of my fabric choice. I am very pleased with my finished gilet. There is nothing to dislike about the pattern. Tyber Faux Fur. Beautiful quality. I removed the overlap at the front of the vest, and sewed in fur hooks to close the gilet. I ended up removing the in-seam pockets; there was a very strange shape at my hips so they had to go to rectify the problem. I added a hanging chain. I omitted most of the understitching (kept it only at the armholes), and also omitted all of the topstitching. I lowered the armholes by 5/8ths of an inch. I cut the pattern at the length line indicated for view A, but ended up adding 2 and 5/8ths inches to the length. I did an approximate 1 inch sway back adjustment. 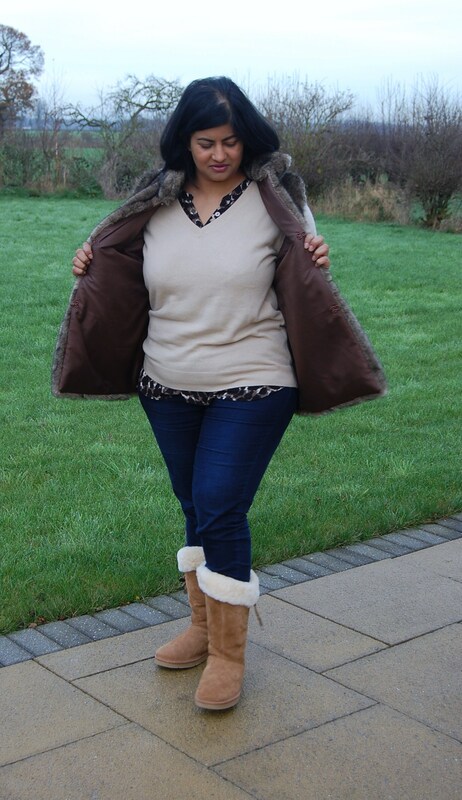 I don’t know if I would sew another fur gilet myself. This pattern worked for me once I made the alterations but I can’t comment on how it would be sewn up in a recommended fabric. It was a pattern I had in my stash. Very pleased with my faux fur gilet. It’s been worn lots and it’s very much on trend right now. So, I have actually been doing a fair bit of sewing. Bit of a blogging backlog now, so expect to hear from me soon. Have a great weekend! Manju, it is lovely! It looks so warm and cuddly for the Winter. Oooh, this looks lovely. 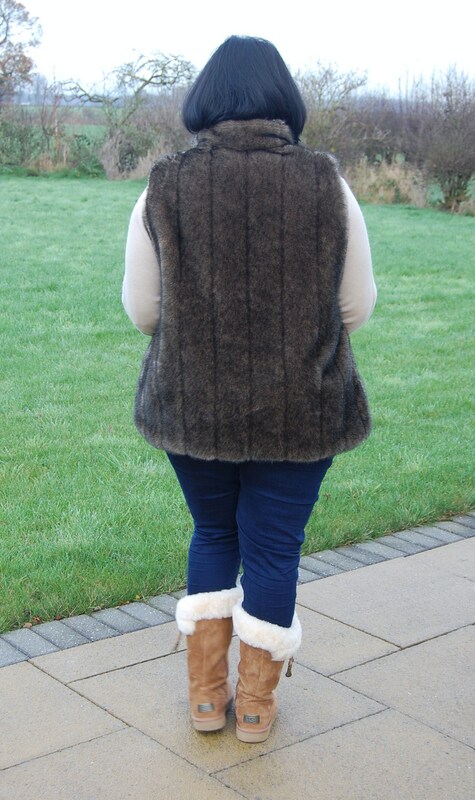 I have a faux fur gilet that I bought last winter, they’re so cosy! Thanks Sam. Yep it’s toasty warm! This is lovely, it looks so cozy and warm. And I love your boots too! Fabulous, this looks great on you. It’s so cute and trendy! Looks warm too. Thanks Amanda. It is lovely and warm. Wow! So very professional looking and you look great wearing it. Such a cute outfit! Love this! And this looks great on you! Thank Myra. Love your vest it looks so glam! Oh, I totally love it. 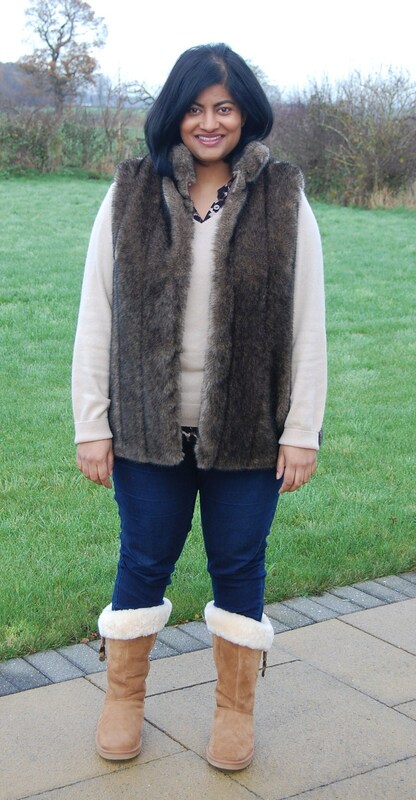 Between you & Rachel Pinheiro I am having massive faux fur gilet envy! You look so chic and cozy warm! You’ve done a great job balancing the lines on the fur. And I would so buy your vest. Pingback: Handmade Holidays Nov. 18: Luxe Gifts | Sew Mama Sew | Outstanding sewing, quilting, and needlework tutorials since 2005.